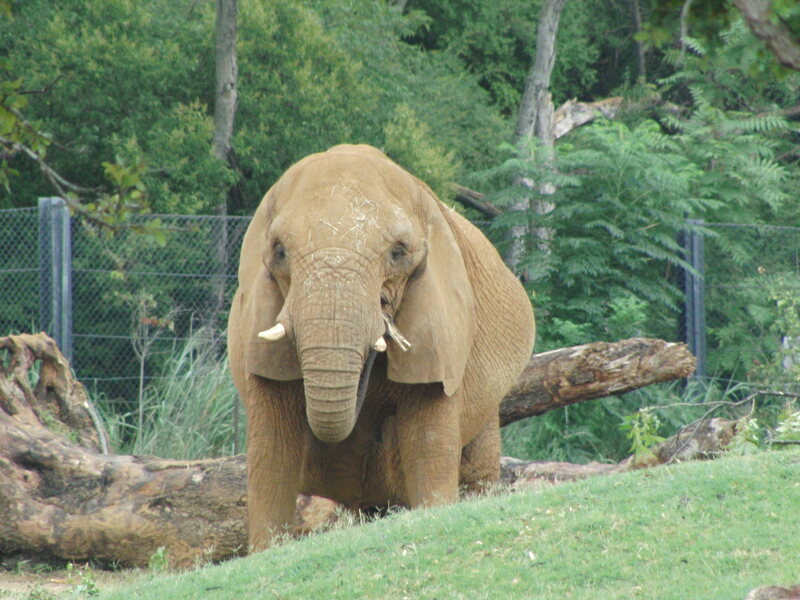 The biggest attraction at the Dallas Zoo is the “Golden Girls”, the zoo’s herd of 5 female African forest elephants. Led by Mama, the oldest of the elephants, the girls are a thrill to watch! 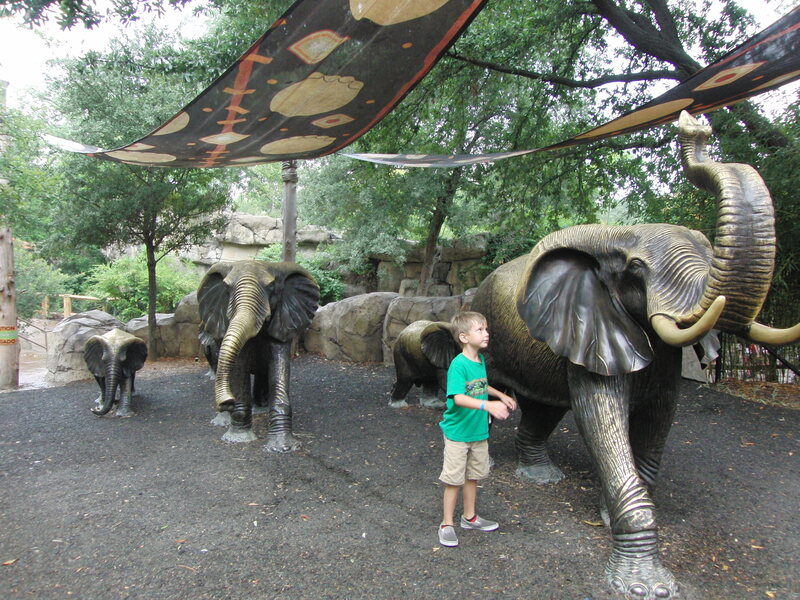 Check out my Mommy Tips for seeing the elephants at the Dallas Zoo. Each day at 11:30am and 1:30pm, two of the elephant keepers come to Base Camp for an informal They entice the elephants to come closer with bits of apples, and it’s fun to watch as they scoop up the apples from the water with trunks, and even trumpet for the fruit! They tell you a little of the history of each of the Golden Girls, who had circus and movie careers before coming to the zoo. 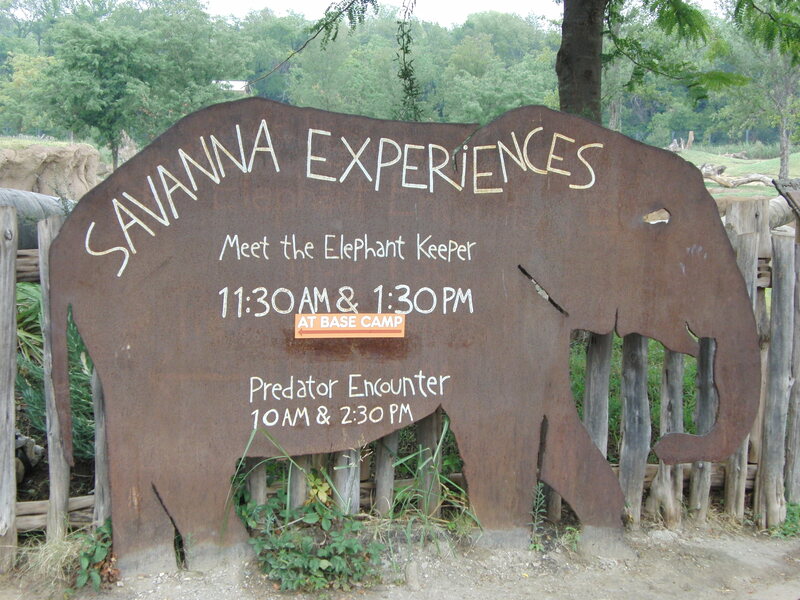 They also answer questions about the elephants, and even about working in a zoo! Located in front of the elephant habitat is Base Camp. You can find it by following the elephant tracks in the walk. Inside Base Camp, zoo volunteers answer questions about the elephants and other animals at the Giants of the Savannah exhibit. Along the back wall, there is a game that test their elephant knowledge, along with 3 videos. 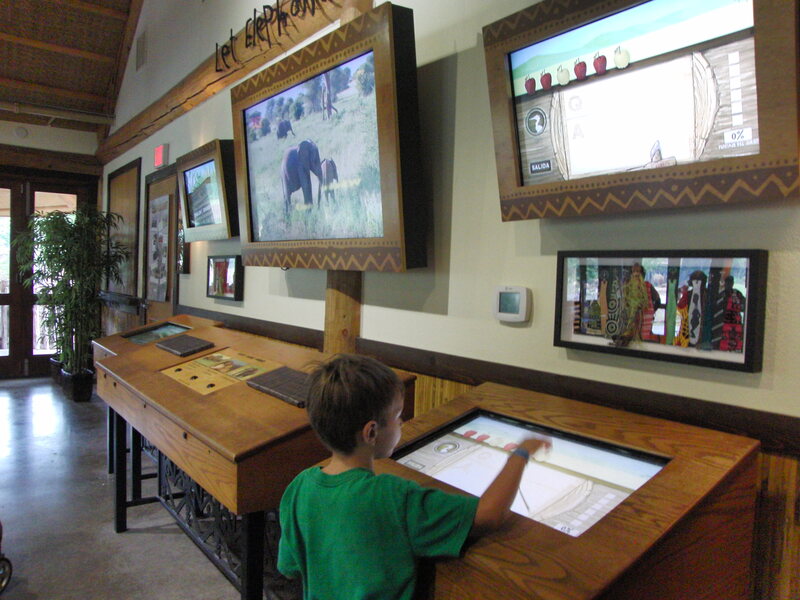 Base Camp is a favorite summer destination because it’s air conditioned, and furnished with comfortable chairs where you can watch 3 videos about animal conservation. FAMILY restrooms are located in Base Camp. 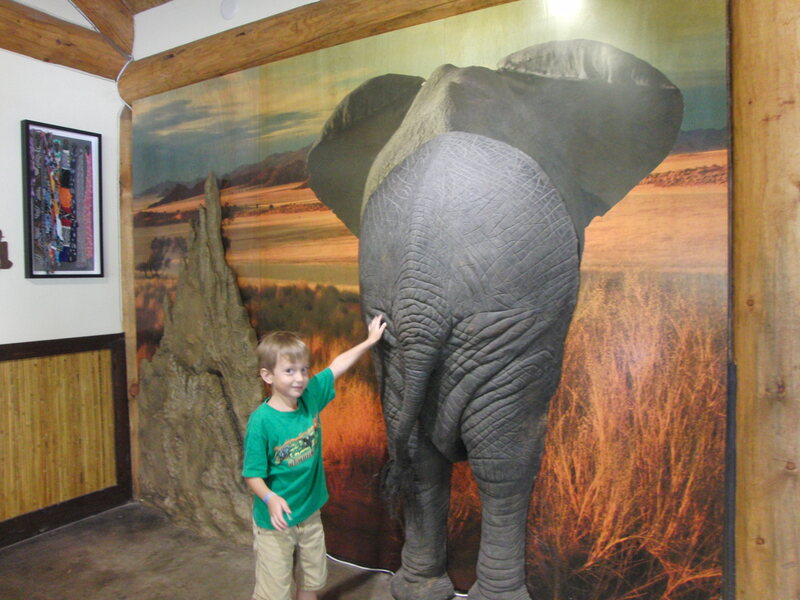 Guest can get a real sensory experience from seeing and feeling the elephant hiney, also located inside the Base Camp. Careful though, because a button on the back end will provide you with elephant noises, some coming from the trunk, and some not. I’m just glad they don’t try to recreate the smell! Elephants are disappearing from the earth at 96 a day, mostly due to poaching for their tusk, which is nothing but a tooth. The cast skull show where the tusk emerges from the skull, as well as the elephants other teeth. 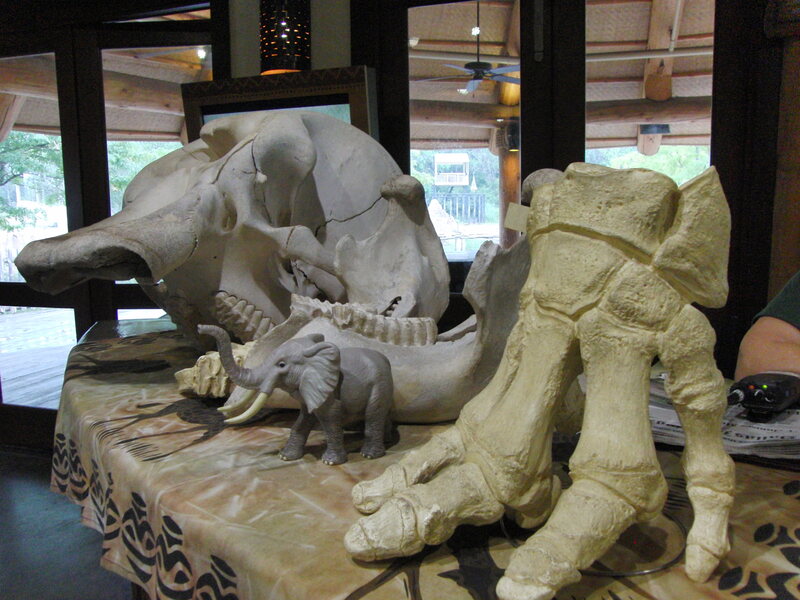 There is also a cast elephant foot, which seems very petite considering they hold up approximately 5 tons of elephant weight! This strange looking tree with a stranger name is one of the first things you see when visiting the elephants. 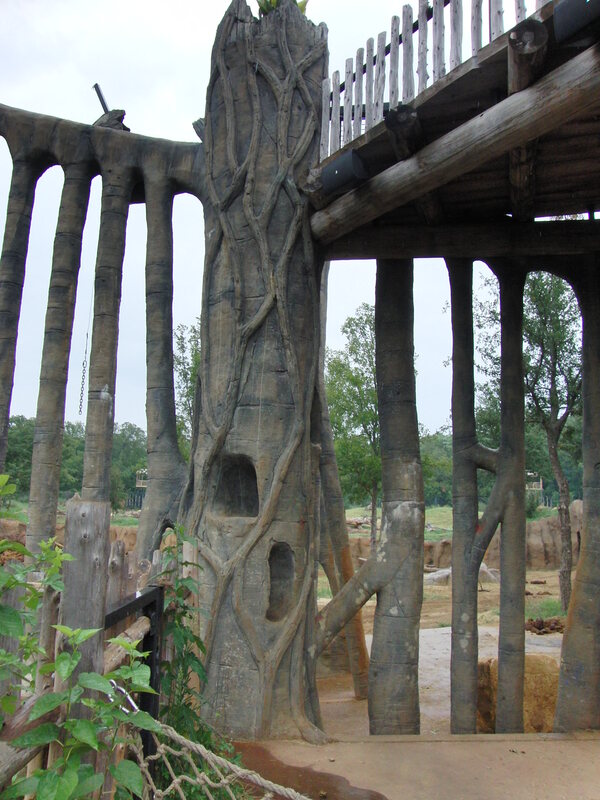 A man-made model of the African Strangler Fig, which grows on host trees, eventually killing them. Elephants love to search for food, and to keep them entertained and satisfy some of their explorative nature, the staff will hide snacks in the tree, and all throughout their enclosure. 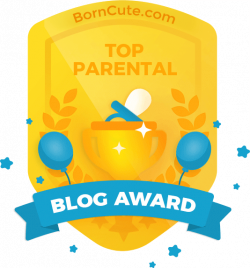 It’s fun to watch as their long, sensitive noses poke and prod through the little nooks in the tree. The zoo is partnering with 96 elephants to bring attention to the plight of the African Elephants in the wild. One way to do this is to download a “Jenny” coloring sheet and decorate it! Then take an “elphie”, a selfie holding your creation, and post it on instagram or to the Dallas Zoo’s facebook page. You can also bring in your picture to the zoo on August 12th for $5 admission on World Elephant Day, and a $5 behind the scenes tour of the elephant barn, with proceeds going to elephant conservation! Click HERE to download the picture of Jenny. Several times a week, the gates separating the elephants and the giraffes, zebras and ostriches are open, making the Dallas Zoo the only zoo in the United States, and one of only 2 in the world, to combine elephants and giraffes. It’s a work in progress, as the animals have been slowly introduced to one another, but it’s a treat to watch how they interact with each other! While you can’t ride on an elephant at the zoo, you can see what it would feel like when on top of one of the four elephant statues that mark the entrance to the Giants of the Savanna exhibit. Although they are shaded, they do get hot during the summer, so grab your pictures early in the day! 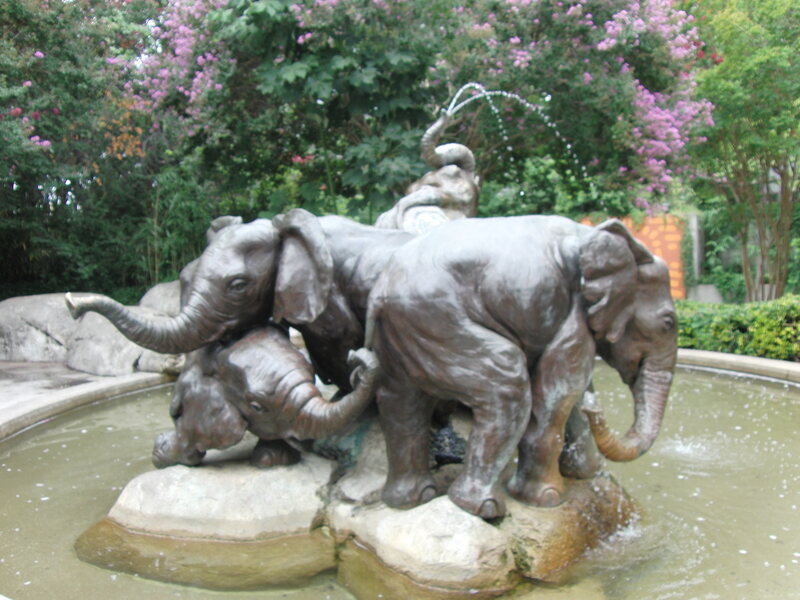 The iconic Elephant Fountain is probably the most photographed place at the Dallas Zoo, but don’t miss the walk behind it, that follows a man-made creek that fills the fountain. You won’t find any elephants on the walk, but it is shady and you can search to find the elephant ears growing along the creek bed! 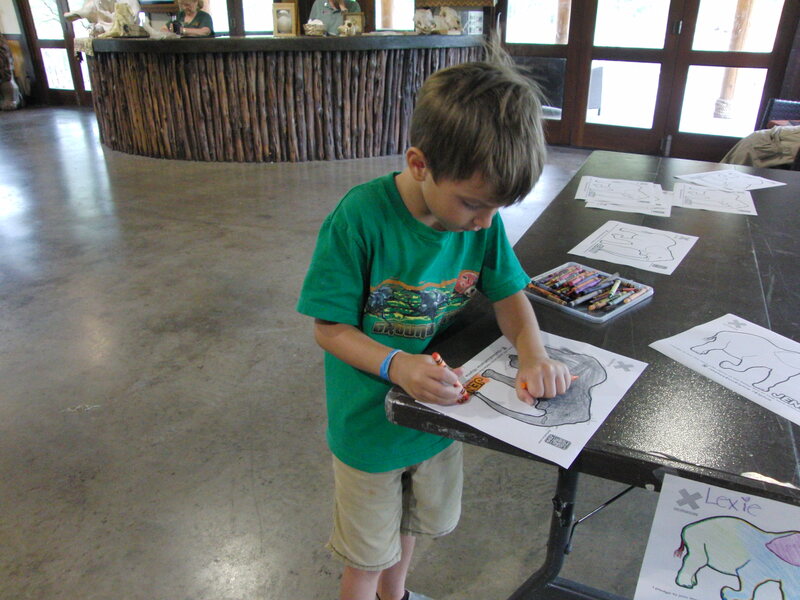 Wear comfortable shoes, the Dallas Zoo sits on 106 acres, the largest zoo in Texas! The Elephants are located in the Wilds of Africa. There are 2 places to purchase food, and plenty of tables for a picnic. Take cash to purchase food to feed the giraffes. Water bottles can be filled at any of the zoo’s food vendors FREE of charge. 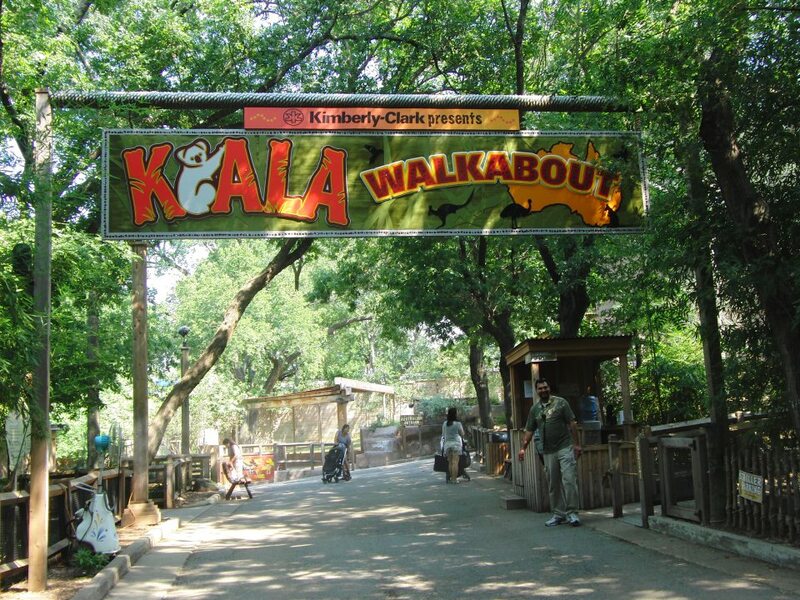 Click HERE to check out our last Dallas Zoo post, the Koala Walkabout!